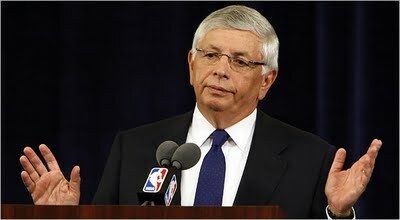 NBA Commissioner, David Stern, plans to hold a press conference today before Game 5 of the NBA finals in Los Angeles. He's the fourth man to hold that title in the history of the NBA, and has held that title for 24 years, back when there was a long-running Celtics-Lakers rivalry. It's his league. He built it so that at one point. let by the fame of Michael Jordan, it was the second most-watched sport on US television. Since the late 90s, the NBA has faded in both spectatorship and in terms of game quality. A game of forwards and guards has become a simple game of 'give the ball to the big guy.' A game of colorful, but friendly rivalries has given way to physical brawls and some of the ugliest moments in American prfessional sport. It is a sport in which a young man with enormous talent, but an over-inflated ego and total lack of respect for his teammates and coach was, at one point, compared to Michael Jordan. Fortunately, his teams collapse in Game 4 of the 2008 Finals ensures that he will never be compared to Jordan again. But back to David Stern, the man who has been at the helm for both the rise and fall of the NBA (1979-2004, as I see it). He has been battling a crisis involving betting by one or more referees, and possible game fixing, which is still under investigation. When the so-called NBA Betting Scandal broke last July 20th, it was bad news. So far, only one referee, Jim Donaghy has been convicted in the scandal. But I think that today's expected blanket denial that the scandal involved more than one referee, and possibly included game-fixing, is the wrong move. A more appropriate response would have been to say that the league would go to extraordinary lengths to remove suspicions. An independent expert, along the lines of former U.S. senator George Mitchell, who looked into the steroids issue in baseball, could evaluate NBA officiating, examine whether some refs are too cozy with individual players (some of whom provide marketable autographs and other gifts), and determine whether Donaghy was indeed a lone bad apple. Stern used to know how to deal with things like this. The undisputed "best commissioner in American sports" could handle every crisis that came his way, and he did it without a hiccup. But he's wrong if he thinks he can solve this stain that Donaghy is putting on his league by telling everyone that the admitted game fixer is merely some desperate rogue trying to rat out anyone and everyone to get the feds to reduce his prison time. What he should be saying -- actually shouting it in front of as many television cameras as he can -- is that he is going to get to the bottom of this with the mother of all independent investigations. Someone other than the NBA needs to get to the bottom of every creepy, sleazy and suspicious circumstance and wild allegation. Continued blanket denials and brush-offs are not going to make these latest allegations -even from a convicted felon- go away. Stern is showing that he no longer has the magic touch in managing his once-great league.